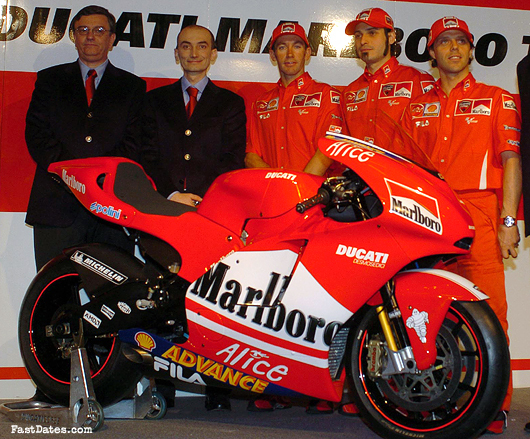 Left to right: Ducati president Frederico Minoli, team director Claudio Domenicali, rider Troy Bayliss, team manager Dario Raimondi, and rider Loris Capirossi. Bolonga, Italy, February 1st, 2004 - Right out of the box the first 2003 season Desmosedici proved to be a competitive bike, even demonstrating areas of excellence against rivals with more experience. 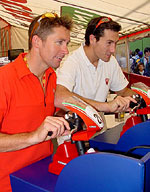 The Desmosedici project capitalized on Ducati Corseís four-stroke competition experience in years of World Superbike success. Guided by the knowledge that lap times are the only sure-fire sign of competitiveness, Ducati Corse engineers organized the project right from the start with the aim of creating a prototype that combined their experience with the new possibilities offered by the MotoGP regulations. 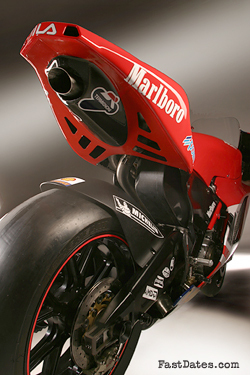 The data acquired by the Ducati Marlboro Team during the 2003 season in 16 GPs and over 30 days of testing carried out by Capirossi and Bayliss, and the development team with Vittoriano Guareschi (more than 30,000 kms last year), have enabled the engineers to better understand the areas where improvements can be made for the 2004 version. Many changes have been carried out. More than 60% of the 915 individual components that make up the new bike are totally different and cannot be interchanged with the previous version. "The experience we gained in 2003 was fundamental for the creation of the GP4î explains Filippo Preziosi, Ducati Corse Technical Director. ìWith the aim of improving the bikeís overall performance and rider comfort, we intervened in various areas of the chassis and the engine. The result is a major evolution of last yearís bike. The project is very young and it is natural that in this phase, the changes will make the GP4 considerably different to the GP3, albeit remaining faithful to the basic philosophy." "Last year was a learning season for us," declares Ducati Corse Managing Director Claudio Domenicali. "We had to learn everything about the new bike, which often raced on tracks that we had never seen before. Loris immediately adapted to four-strokes and our working method, and right from the start gave us some great results and real excitement. Troy had to learn numerous circuits and change his riding style to MotoGP power, but adapted quickly and his three podiums are a demonstration of this. The results obtained confirm that the project has solid foundations, on which we must continue to grow, and we feel that we are stronger than one year ago. Our working group, from Loris and Troy to all the guys in the company, has demonstrated a devotion and professionalism that fills us with pride. All this would not have been possible without the support and the trust of our partners. First of all Marlboro, which believed in us right from the start; Shell Advance, with whom we have a long-standing technical partnership; and Fila and Michelin to name just a few. A warm welcome also to our new partners, including Alice, the prestigious Telecom Italia brand with whom we have also started collaborating on a company telecommunications level. I am sure that the season that is about to get underway will see us contenders in a World Championship that on paper is very evenly balanced and for this reason even more exciting. We are starting the season with the knowledge that we have grown up but aware that the project is still young and in its development phase". Loris Capirossi and Troy Bayliss are ready to face up to this new challenge. Last year both confirmed themselves to be at the top of their game and capable of giving 100% on every occasion." in order to improve cooling while maintaining the bikeís excellent aerodynamic characteristics. It is also made up of four components instead of two in order to improve access for the mechanics. Front mudguard: a new larger front mudguard improves the aerodynamics and increases airflow towards the radiator. forks, which enables weight to be saved. 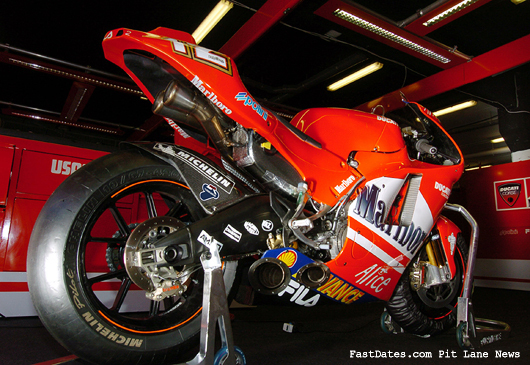 terminating under the tail unit, like last year and in the best Ducati tradition. The horizontal cylinder arrangement terminates on the right of the bodywork. The new exhaust lay-out has enabled the fuel tank to be modified and furthermore has been designed to improve power delivery. while retaining the same stiffness. mountings, making it easier to assemble and remove the engine itself. The dimensions are the same as the 2003 version. Airbox: the airbox is larger than the previous version, thus contributing to an increase in power and a difference in the torque curve. of 230 HP at 16,500 rpm, an increase of around 10 HP and 500 rpm on the 2003 version). Electronics: Magneti Marelli electronic hardware is the same as 2003 but new software has been developed. "All the technical partners with whom we are in contact daily have contributed in a decisive way to the development of the Desmosedici and the increase in performanceî comments Filippo Preziosi. ìTo mention just two, Shell Advance, together with whom we develop lubricants capable of improving the performance and reliability of our engine, and Michelin, with whom, amongst other things, we are developing 16.5î front tyres, which have been used successfully for many years by Ducati Corse in Superbike." This evolution will continue throughout the racing season on Ducati Corse test-benches and on computers, guaranteeing not only a continuous improvement in performance, but also a constant increase in Ducati know-how, which will be used for the development of road-bikes, as in the best tradition of the Bologna manufacturer. At left, the 2003 GP3 machine with twin tail pipes exiting the open rear tail section. Above, the new 2004 GP4 bike has a smaller, more aerodynamic tail piece with a single exhaust tail pipe. Note the lowered fuel tank above the swingarm and rerouted exhaust pipe. Below: 2004 Desmosedici Twin Pulse with 4 pipes. 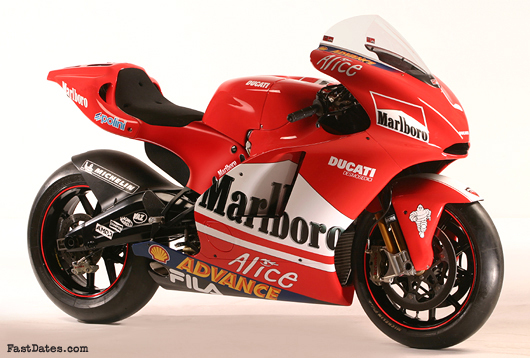 Above: The new 2004 Twin Pulse MotoGP 4 introduced in mid season in June 2004. 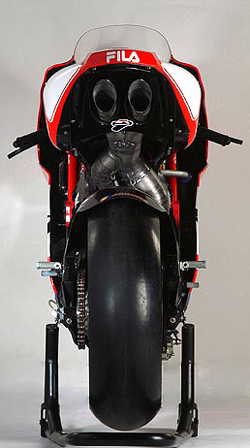 The sight of four exhaust pipes on the new Ducati Twin Pulse MotoGP04 with one per 4 valve cylinder, the rear 2 cylinders exhausts exhiting under the sea, t and the front cylinders under the swingarm,really looks agressive. Click for a better view. Ducati Corse Press, Catalunya (Spain), Monday 14 June 2004 - The new Twin Pulse engine that was given its shakedown last week at Mugello by factory tester Vittoriano Guareschi, was used for the first time today by both Ducati Marlboro Team riders, who stayed behind at the MontmelÚ circuit the day after the Catalunya Grand Prix. Loris Capirossi and Troy Bayliss backed up the positive view expressed by Vittoriano: that the new engine, with its irregular firing order, represents a step forward over the previous version. It improves 'rideability' and allows the riders to have better consistency in their performance. Both Capirossi and Bayliss, who did not focus on setting quick times, used the day's testing solely to gain confidence with the 'Twin Pulse' and its behaviour. Weather conditions today were good (25∞C air/41∞C track), mainly sunny with a few drops of rain that did not interfere with the testing. After 72 laps out on the track and a best time of 1'44.5, Loris Capirossi was pleased with today's work. The Italian rider also carried out back-to-back testing with the engine used during the weekend. " 'I am pleased with what we did today: I enjoyed myself on my bike again and we worked really well during this first test for the new engine", declared Loris. "Compared with the previous version, the Twin Pulse has greater potential. Of course we have to get to know all about it and test it again, in particular to adapt the settings and the gear ratios to its characteristics, but I think that we can be satisfied with the first day. I can't wait to get back to being one of the front-runners again!" Despite yesterday's spectacular crash, Troy Bayliss got back onto his Desmosedici GP4 late in the morning and completed 46 laps of the track, the best time being 1'45.0. His pace was also good, quicker than the times set during Sunday's race. Despite still being in a bit of pain, the Australian was also satisfied with the new engine. "I like the Twin Pulse, it's a lot better than the engine we've used up to now", commented Bayliss. "It makes the bike easier to ride and I feel a lot more comfortable on it: just look at my times, they are good today despite me not being in perfect shape. Tomorrow morning I'll see how I feel and decide whether to continue testing or go back home for a rest'. June 15th: The second and final day of testing for the Ducati MotoGP Team at the Montmelò Circuit, Catalunya, was cut short by changeable weather conditions. Heavy showers during the morning meant that Loris Capirossi was unable to lap with any consistency, but the Italian did go out on the track for several laps to gauge the behaviour of the new engine in the wet. Team-mate Troy Bayliss, who crashed spectacularly during Sunday’s race, opted not to continue testing today and returned home this morning to get back into shape as quickly as possible. Loris Capirossi only completed a few laps in the wet, but this was sufficient to confirm yesterday’s positive sensations: the new engine considerably improves the bike’s ‘rideability’, a characteristic that Loris particularly appreciated given the characteristics of the track. The new irregular firing order Twin Pulse engine has met with approval since being tested at Mugello and, as confirmation of this, both Ducati MotoGP Team riders will use the new engine in the Dutch TT at Assen. Editor's Note; When the V-4 Desmosedici was first developed in 2002 it was tested in a V-Twin style "Twin Pulse" tandum piston stroke and firing order on each bank to give it the successful power impulse of Ducati's V-2 Superbike engines. It was also tested with s a conventional 90-degree firing order with staggered piston / crank pin placement. The origional Twin Pulse design and tandem firing order proved to be too violent on the lightweight GP engine design's reliability and was never raced. This new Twin Pulse engine for 2004 retains the old tandem crank/piston movement per cylinder bank, but the firing order is now 180 degrees apart per cylinder to stagger the power impulses evenly over the 720 degrees rotation of a 4-stoke engine to fire a cyclinder and not overstress the engine. 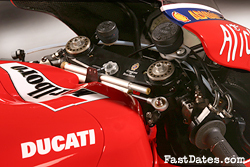 Ducati’s long-favoured 90-degree ‘L’ configuration offers advantages that have also contributed to the factory’s racetrack successes. The layout provides intrinsic engine balance, a fundamental consideration in an engine that revs at over 16,000rpm, and minimum vibration, good for mechanical efficiency and reliability. The desmo system, designed by legendary Ducati engineer Fabio Taglioni, uses rockers to close as well as open valves, allowing particularly accurate valve operation, whatever the rpm. Desmo-driven valves also offer minimum power loss, especially in the low-to-medium rpm range, compared to other timing systems, especially pneumatic. The Desmosedici's GP4 engine has a new combustion chamberand a number of changes have been made to reduce internal attrition. Further changes have also been made to reduce weight. The result is more power (now in excess of 230 HP at 16,500 rpm, an increase of around 10 HP and 500 rpm on the 2003 version). The airbox is larger than the previous version, thus contributing to an increase in power and a difference in the torque curve. Just added! Giant 12" x 17" screensaver image of the top factory race bikes. desmodromic DOHC, four valves per cylinder. for preload, compression and rebound damping. Tyres: Michelin, 17" or 16.5" front, 16.5" rear. steel rear disc with two-piston calliper. 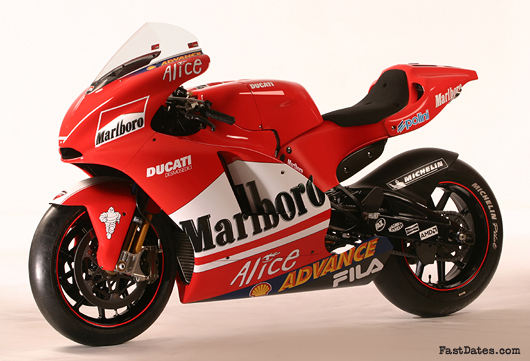 July 2002 - Four-cylinder 989cc ‘L’ engine, with simultaneous firing order in cylinders of the same bank and desmodromic timing – Track tests to get underway in July also in traditional firing layout – Race debut with two riders at first round of MotoGP 2003. Nine months after the start of the MotoGP project, announced last May at Jerez de la Frontera, Ducati Corse has completed the design stage of its new engine, called Desmosedici (16-valve Desmo), which will begin testing on the dyno within the next three months. “For this reason, in the preliminary study phase, we considered a twin-cylinder oval piston engine to be an excellent layout for the new regulations. With the same weight as 4 and 5 cylinder engines, this layout combines the typical advantages of a twin in terms of power output and delivery, with the performance necessary to compete at the same level as the multi-cylinder units”. “But further analysis led us to decide that the best solution was a ‘double twin’ and therefore we designed an engine with four round pistons which, thanks to a simultaneous two-by-two firing order, reproduce the working cycle of a twin. This will generate the ‘big bang’ effect, making the rear tyre work in a way that extends its duration and improves rider feeling when exiting curves”. “The Desmosedici engine”, continued Domenicali “will have a relatively short development period and reasonable costs and it will then be easily available also for external teams, since it is Ducati Corse’s intention to become a point of reference for private teams in MotoGP, as already it is in World Superbike”. “The Desmosedici power-unit, designed to tolerate the greater stress generated by simultaneous combustion, is therefore a unique engine with a further advantage: it allows two different versions to be tested. As well as the Twinpulse, we will also be testing a layout with a traditional firing order, which will have a slightly higher power output, but probably to the detriment of traction. 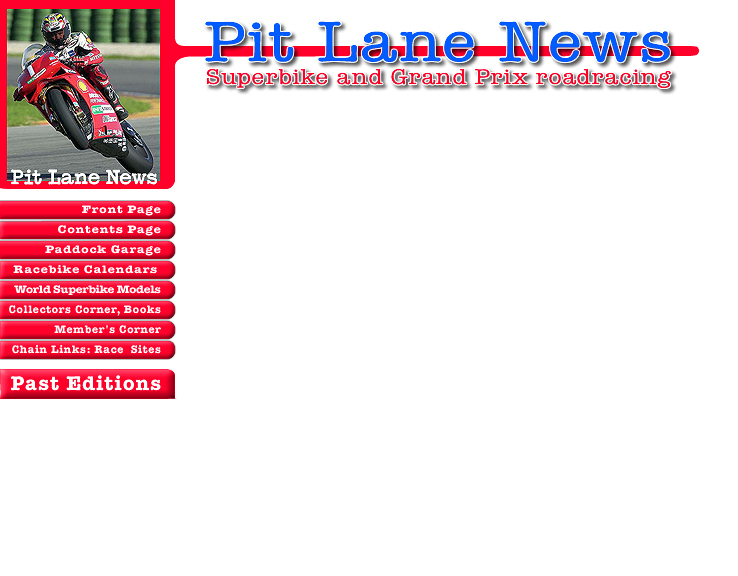 Track testing and rider feeling will decide which layout will be used for racing”. Another characteristic of the Desmosedici – designed by a team headed by Ducati Corse Technical Director Filippo Preziosi – is that it uses a desmodromic valve timing system, an exclusive characteristic of all Ducati engines for many years. “Thanks to this project, we are able to verify the Desmo’s true potential”, declared Preziosi. “Experience accumulated with materials and calculation methods on the Testastretta have allowed us to design an engine capable of exceeding 18000 rpm without all the costs and complications involved in using pneumatic valves”. The first tests on the dyno for the new engine are scheduled for May and a track testing programme will get underway in July. The aim began with the 2003 MotoGP season from the first round with a factory team made up of two riders, former GP star Loris Capirossi and reigning Ducati 2002 World Superbike Champion Trop Bayliss. Last year the rules changed to prioritise four-strokes and the 500 World Championship was transformed into the MotoGP World Championship. Immediately Ducati realised it had to be involved, for while its streetbikes continue to be promoted by World Superbike success, factory engineers realised that MotoGP offers a further opportunity to evaluate innovative and avant-garde technology. 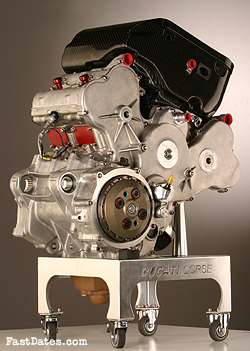 Ducati Corse created two versions of the Desmosedici engine for initial testing back in 2002 – one with evenly spaced firing intervals, the other with paired cylinders firing simultaneously. But early tests suggested that this version placed excessive stress on components, so engineers decided to focus their attention on the conventional configuration. The Desmosedici engine is looked after by a brand-new Magneti Marelli CPU engine management/fuel injection system, which combines maximum performance with optimum fuel consumption. Ducati’s race technicians have been committed to fuel injection longer than any of their rivals and can also count on the experience of fuel and lubricant partner Shell in the search for improved all-round performance. Never afraid to pursue its own avenues of development in pursuit of engineering excellence, Ducati is also unique in its choice of chassis. While other manufacturers race with variants of the ubiquitous aluminium beam chassis, the Desmosedici uses a tubular steel, trellis-type chassis, similar to that employed to great effect in World Superbike. This concept allows excellent rigidity where required, as well as some flex, a useful factor in eliminating chassis ‘chatter’, a particularly complex problem in modern racing. The Desmosedici continues Ducati’s association with Michelin, the French tyre company that has won the past 11 500/MotoGP titles and the past nine World Superbike crowns, and also with Ohlins, the suspension specialists with whom Ducati have dominated World Superbike. No doubt about it, the Ducati MotoGP Team Desmosedici V4 is a forceful new presence in motorcycling’s hardest-fought arena – bringing a heady combination of high technology and fervent passion to the increasingly popular MotoGP World Championship.